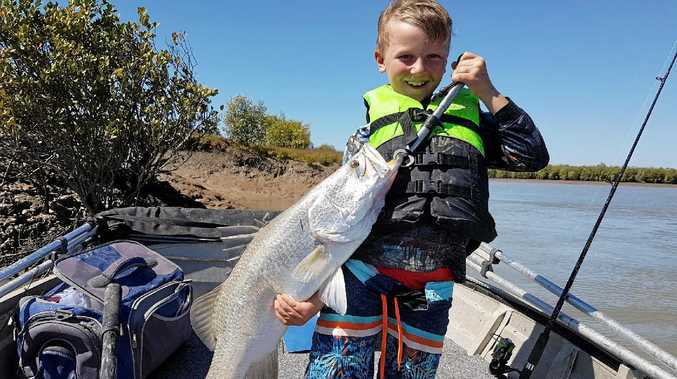 SIXTY anglers from around the state travelled to Rockhampton over the weekend in the hope of finding fishing gold. The King of the Fitzroy is a new fishing competition hosted by the Keppel Bay Sportfishing Club designed to celebrate and promote the iconic king threadfin and anglers that love targeting them. Mick Chelepy took out the crown in senior division with a 1.35 metre river monster. Darren Griffith wasn't far behind, claiming second with a 1.31m king and Gary McClelland picked up third place with a 1.25 metre fish. In the junior division, young Logan Housman landed a 94cm king threadfin to secure first place. In the junior barramundi division, Zade Van Wees landed a 78cm fish to take the win. "With a river that is rapidly gaining a reputation globally as a big threadfin hotspot we wanted to organise an event that promoted the species and those that love to catch them,” competition organiser, Nathan Johnston explained. "While the fishing was a bit tough over the weekend, 20% of the field still managed to land a trophy length king greater than 90cm in length. "There aren't many places close to a major regional centre where these big threadfin can be caught with such reliability and it's great to see the quality of fish coming out of the Fitzroy,” Mr Johnston said. King threadfin come from a family of fish species defined by their long whisker like fins located near their mouths. These whiskers are used by threadfin as feelers in the water to find their prey. This adaptation means they can find food in dirty water a lot easier than other fish. They are known as king threadfin because of their golden colouration and their large size, growing up to 1.9 metres. "Large tropical river systems like the Fitzroy usually have higher sediment loads with big muddy mangrove lined deltas and this is prime king threadfin habitat,” Mr Johnston explained. Local businesses also lent a hand to ensure the event was successful, with Barra Jacks, Bluefin Sports and Seabreeze Marine helping out with prizes. The Criterion Hotel, located on the banks of the Fitzroy in the middle of town, was a very fitting competition headquarters. "We had a variety of presentations on Saturday for the evening meal at the Criterion including a presentation by Cr Tony Williams from Rockhampton Regional Council,” Mr Johnston said. "The new north-side boat ramp was open just in time for the event, which was a real bonus. The event has a low entry fee and encourages junior participation. Anglers can either catch and release their fish or take one or two home for a tasty feed. The Rockhampton Regional Council voluntary code of practice for recreational fishing in the Fitzroy River is promoted at the event along with tagging of fish, including the pink tags the Keppel Bay Sportfishing Club uses. The Keppel Bay Sportfishing Club were happy with the event and plan to run the King of the River fishing competition again next year on 24-25th August. Interested anglers can keep up to date by following the club's Facebook page.